It is one of those days! I feel like I’m being torn in 10 different directions and at the end of it all I have a family expecting a decent family meal. What to do? I scan the fridge and the cupboard to see what I have on hand because I just don’t have time to go to the grocery store. Aaaahhhh…I spot 3 packages of Kraft Recipe Makers on the shelf. I keep these on hand for nights like this. I have three options. All would make a great meal so it’s going to depend on ingredients I have on hand.. 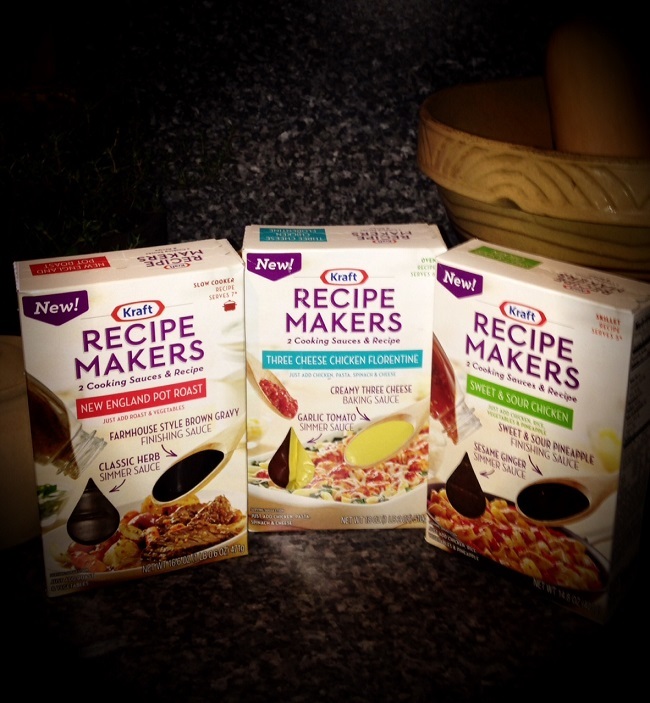 I love these Kraft Recipe Makers! 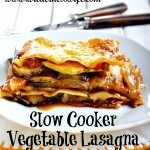 They’re the best “Easy Meal” and there are 3 varieties -slow cooker, oven, and skillet. I have to rule out the slow cooker “New England Pot Roast” because it’s too late to start that for dinner tonight. 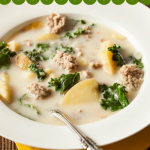 We’ve tried it before and it is really good comfort food. Next I have two that require chicken – an oven dish called 3 Cheese Chicken Florentine and a skillet version called Sweet & Sour Chicken….. both sound good but I don’t have any chicken. All I have for meat in the fridge is ground beef and mild sweet Italian sausage. The Sweet and Sour Skillet Meal isn’t going to work with either meat so that goes back on the shelf. So I’m going with the 3 Cheese Chicken Florentine and the Italian Sausage. This looks like an easy meal maker even though I have to improvise a little. 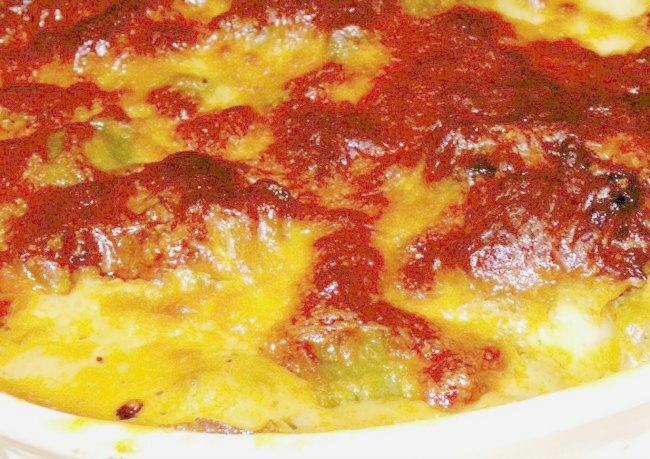 I’ve got some fresh mushrooms, a green pepper, add in a little onion, top with mozzarella and we got a casserole. 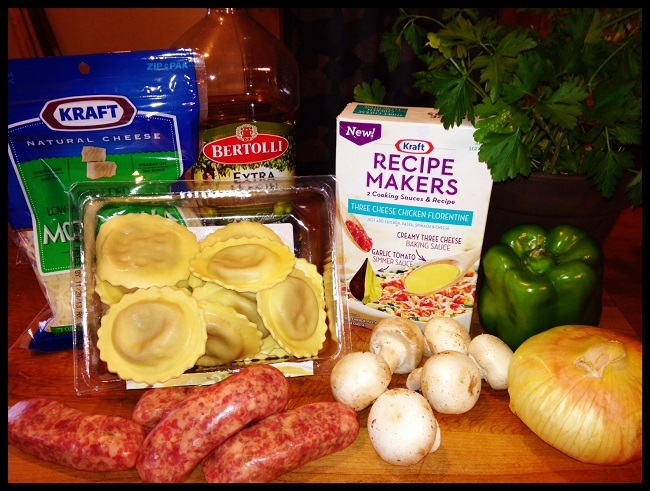 The cast of characters….Kraft Recipe Makers “3 Cheese Chicken Florentine” becomes Italian Sausage Florentine. 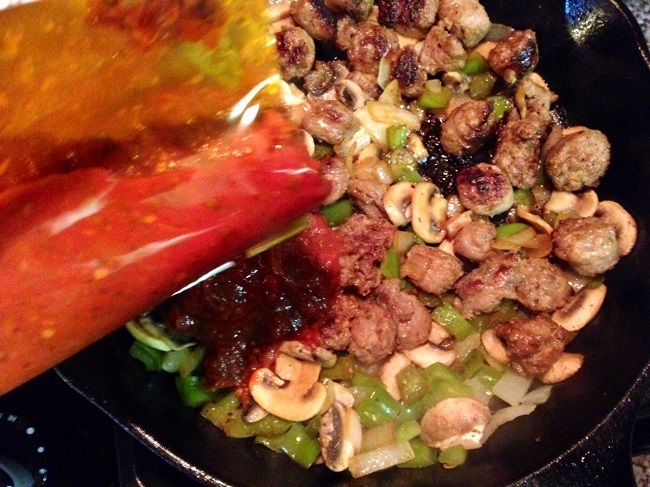 I cut the sausage into 1/2″ chunks and start browning it in some olive oil in my large cast iron skillet (it’s my go to for skillet for stovetop cooking).Once the sausage is brown I remove it and set aside. I drain all but 1 tbsp. of sausage fat from the skillet. I sauté the diced green pepper, diced onion, and sliced mushrooms till the veggies are tender. While they’re cooking, I cook my ravioli in a pot of boiling water and drain the ravioli when they are done (about 8 minutes). Now add the “Garlic Tomato Simmer Sauce” to the skillet and let simmer for 5 minutes till heated through. Now its time to add the simmer sauce. What a wonderful aroma of garlic coming from the pan! 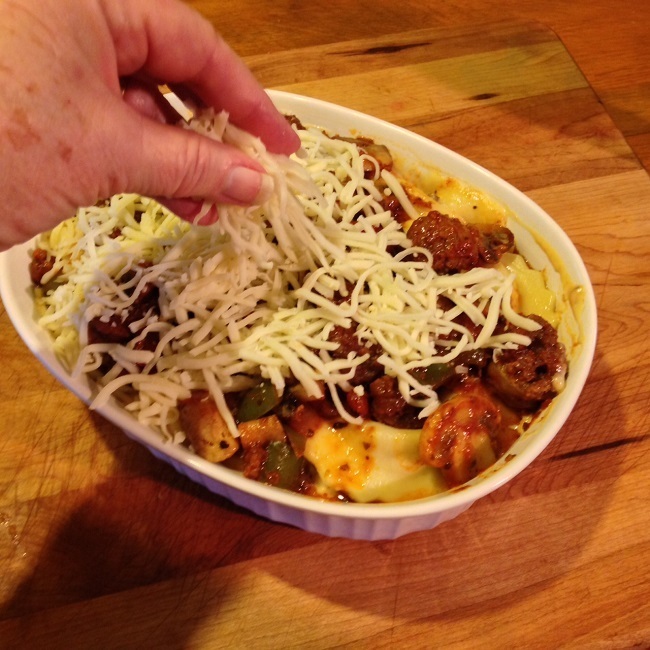 Next I spray my casserole dish with cooking spray and spread a layer of the veggie/sausage/sauce mixture on the bottom, then add a layer of ravioli, then a layer of the Creamy 3 Cheese Baking Sauce ( I use 1/2 of the packet), and then do it all over again. Top with a final layer of the sausage mixture. Sprinkle that with mozzarella and we are ready for the oven. 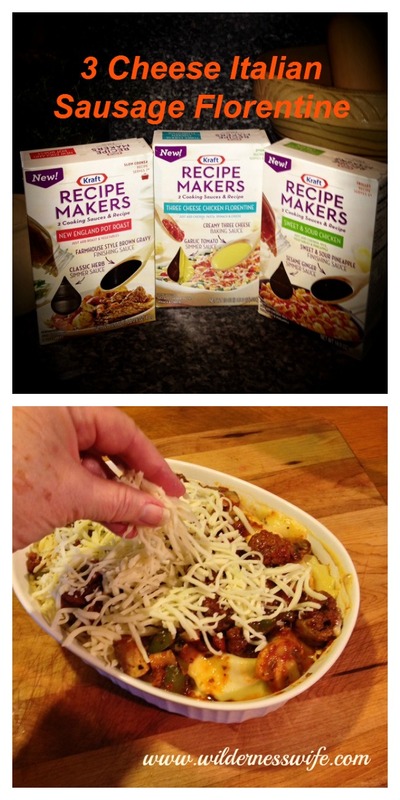 After carefully layering the ingredients, sprinkle on a topping of mozzarella cheese and pop in the oven. All the ingredients are hot so it doesn’t take long! Just pop it in an oven that has been preheated to 375F for 15 minutes (till heated through). Serve it up with a green salad and garlic bread on the side. All done and ready to serve…..actual time – 35 minutes! Lots of melted cheezy goodness…it was yummy! This looks so yummy! Sometimes you just need to have this kind of stress-free, easy dinner. Especially since it looks so delicious. Pinning…definitely going to try this! I would love for you to come over and link up at Wine’d Down Wednesday if you get a chance. We party every week from Tuesday evening to late Friday night! Hope to see you there!